I’m excited to be joining a group of blogging friends today to bring you a fun, Christmas blog hop! 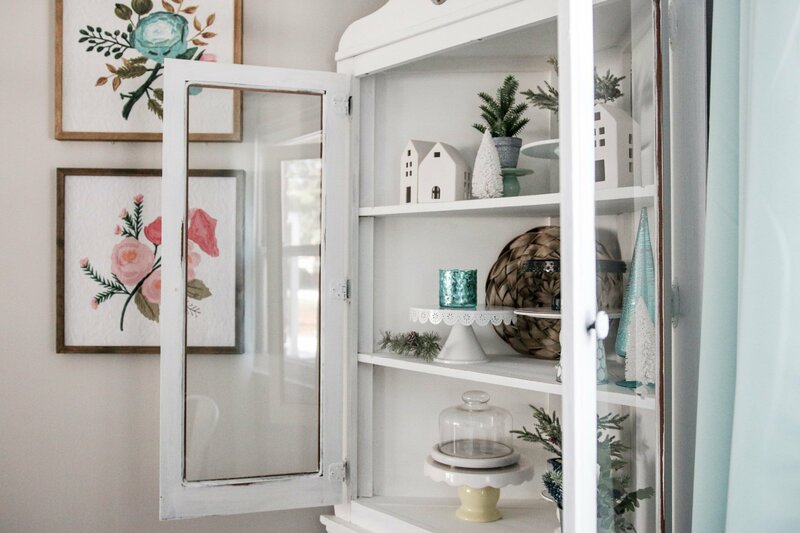 We’re each sharing portions of our home with you today. I’m so glad you decided to stop by! 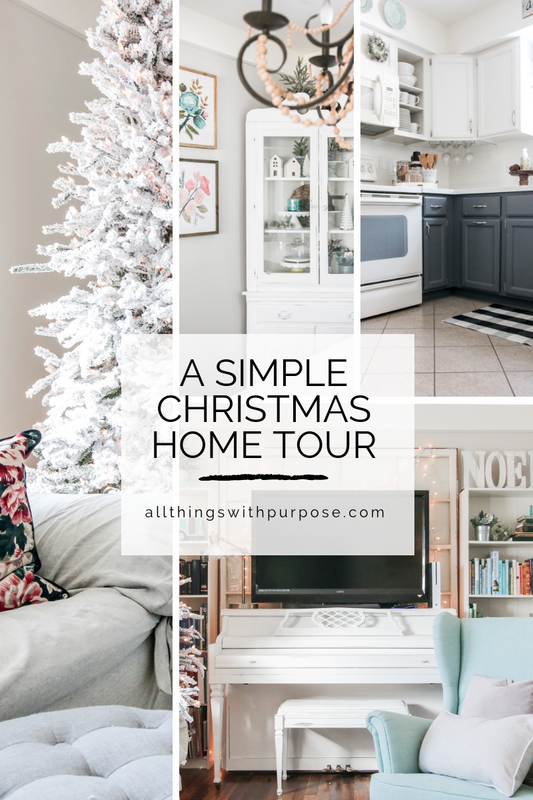 Welcome to my simple, Christmas home tour! A special welcome to you if you’re joining me after visiting Carrie from Lovely, Etc. We’ve set up this tour to make it easy to stop from home to home. 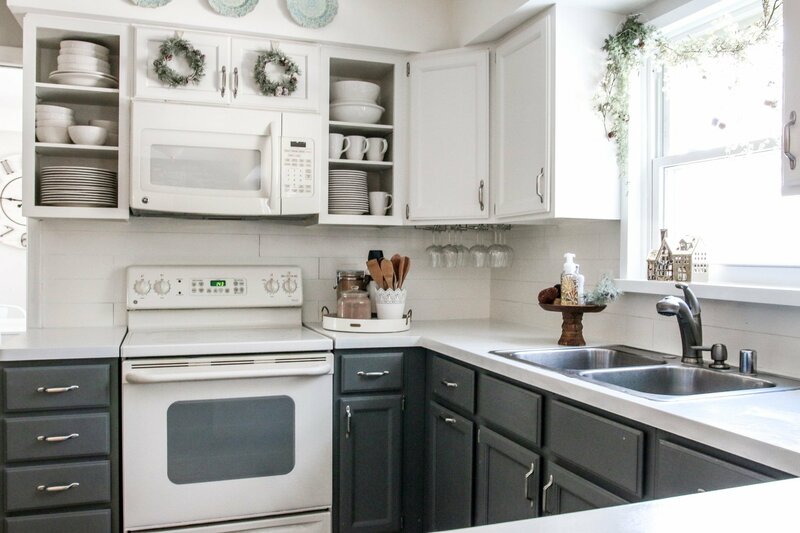 At the bottom of this post, I’ll link to the next home on the tour and you can just keep going from there! 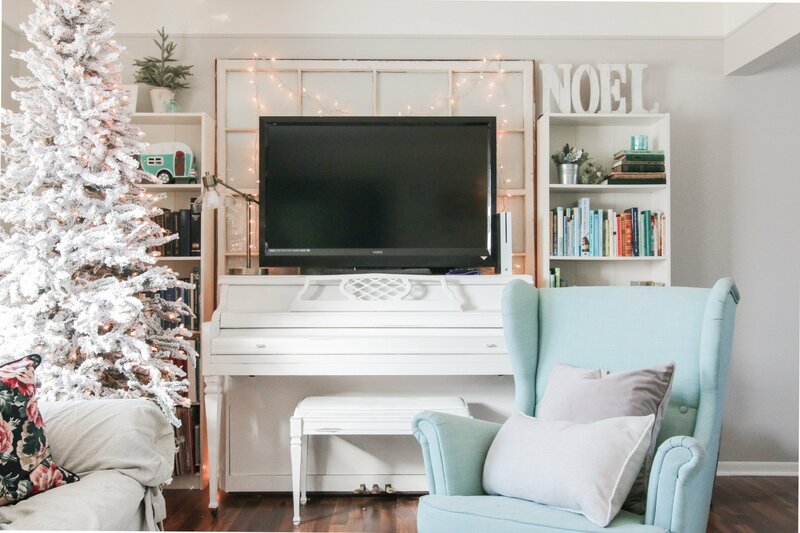 I’ve called this a simple Christmas tour, because I feel like I’ve really scaled back my decorating in recent years. I absolutely love Christmas, and it’s really the only holiday I actually decorate for. But, this past year has been challenging to say the least. We adopted a baby boy in the Summer of 2017 and then became the guardians of an 11 year old girl this past Spring. We grew from 3 to 5 kids in such a short window of time and I haven’t really caught my breath since. 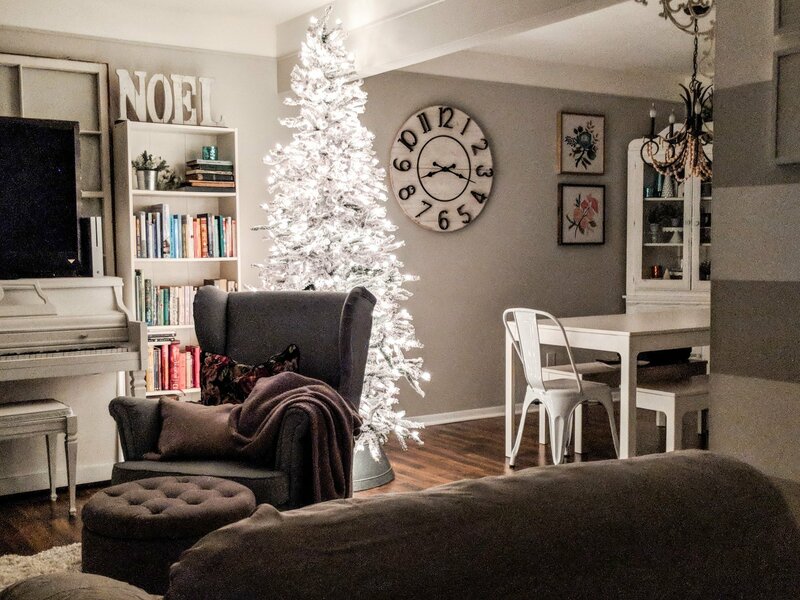 I am pouring more and more of my energy into being a good mom, and there is so much about the Christmas season I want to enjoy with my kids, without being stressed. Our family has really struggled to find a new rhythm, and part of that has been finding new ways for everyone to help out. I feel in-over-my-head on most days, so I am trying my best to provide my kids with more responsibilities and structure. Chore charts are my jam. 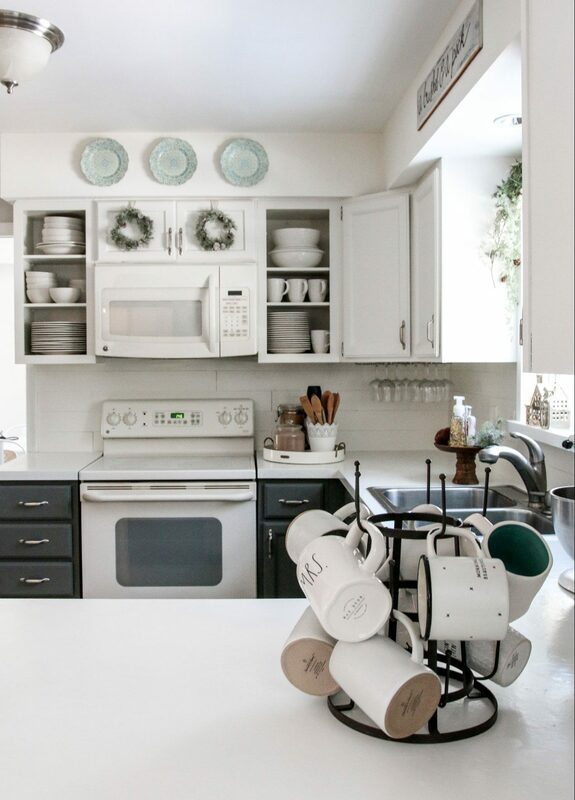 Though it’s practically a full time job keeping up on every chore that has been assigned (hello, 5 kids! ), it makes a huge difference when the kids are held to a standard of helpfulness. 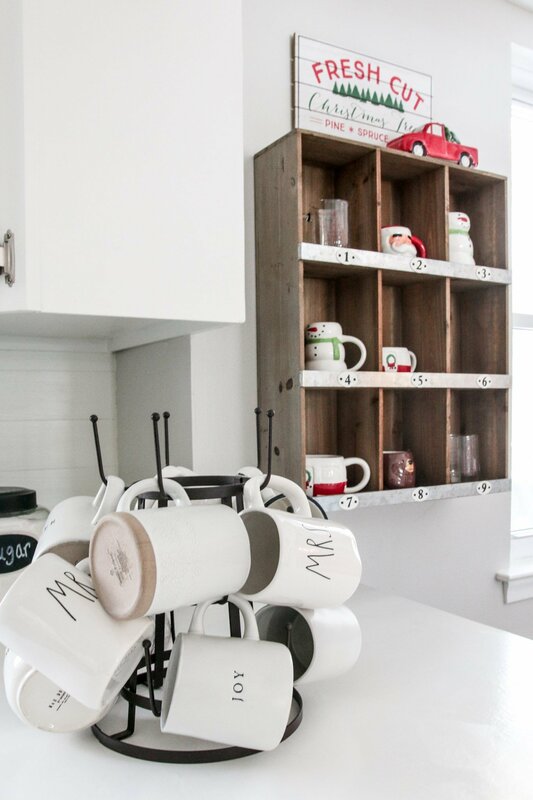 This Christmas season, we are really working on keeping things organized and keeping mom sane. That means, less decor and more… teaching an 11 year old to clean the inside of the fridge, or an 8 year old to do laundry. It means a lot of coaching and extra time and patience. It also means kids that can now bake Christmas cookies all by themselves (what a time to be alive!). 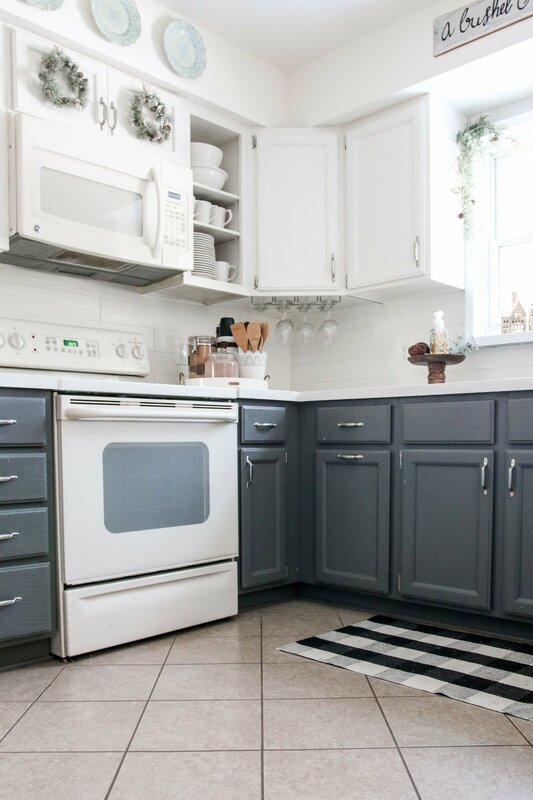 I’ve simplified parts of our home that make it easier to keep things clean and in order. 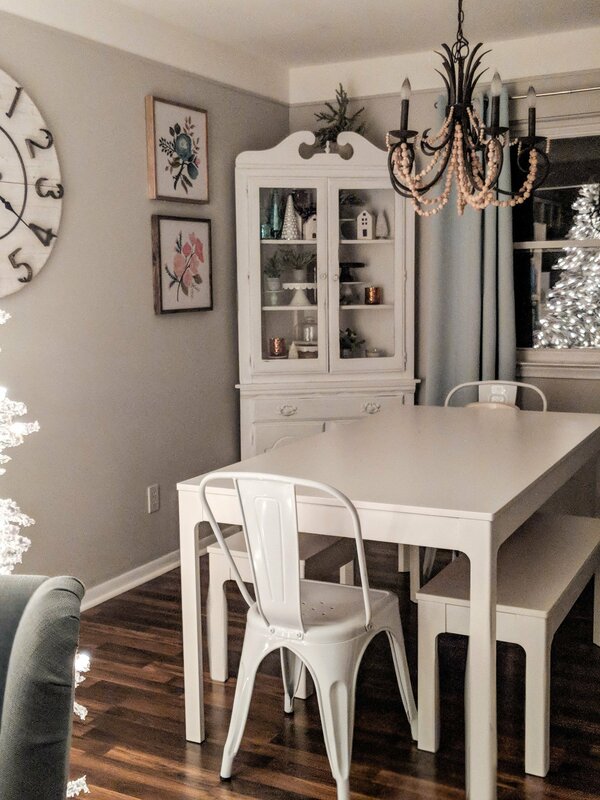 We sold our bulky, traditional dining set this past Spring and opted for a simple, white table and metal chairs. We took down a bunk bed set that made it hard for the kids to make their bed, and opted for two twin beds instead, with zip-up bedding. 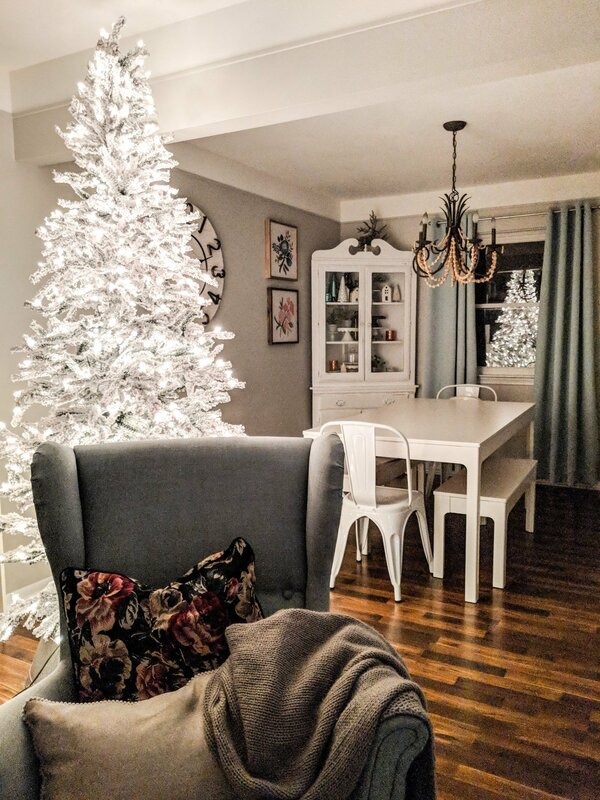 I also chose NOT to put full size trees up in each of the kid’s rooms this year (gasp!). I know, things are real here, y’all. Instead of setting up 7 trees, we only did 2. 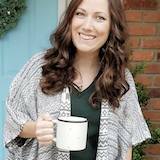 If you don’t believe I’ve been making changes to simplify my life, that should be proof enough! The kids each have their own little mini tree from the dollar store, but that is it. 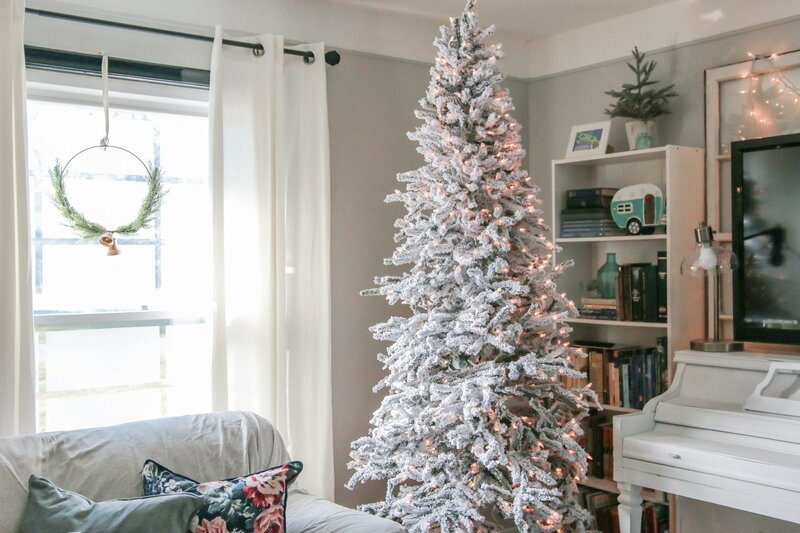 I bought a new, flocked tree this year with every intention of keeping it completely naked! 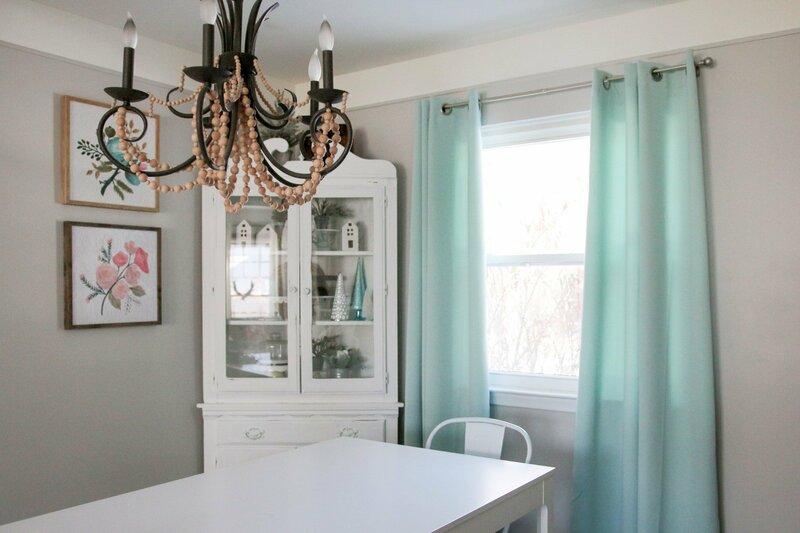 I’ve had to restrain myself a couple times, but as part of my simple Christmas challenge, I’m leaving it un-decorated. We have a slim tree in the other living room that the kids decorated with their favorite ornaments (just in case you were worried). I love the peacefulness of a quiet home at night. When the kids are in bed and there is nothing left but to sit in stillness and enjoy the warm glow of the Christmas lights. Who am I kidding? There is always something else to do, but there is no other time of year that can convince me to sit on a couch, in the dark and simply be still. 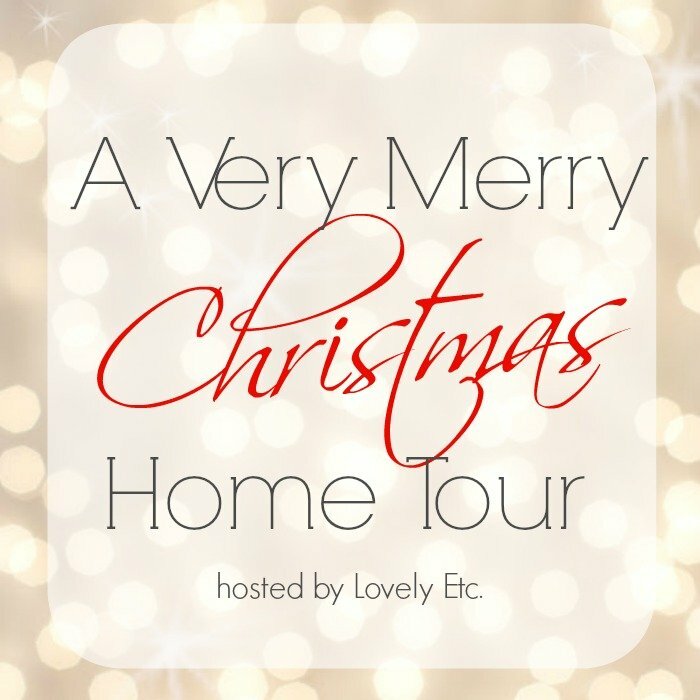 Now, be sure to continue on to the next stop on our Christmas home tour! I just love your festive and creative touch! Seven trees! That sounds incredible. And a lot of fun and work. It is so nice to get to know you, Sarah! 7 trees, oh my goodness. Congratulations on your growing family! I really really want to have a plain tree one year. Getting those ornaments out is 1/2 the battle in my storage area (Christmas nightmare lol). Merry Christmas! Sarah, this is such a wonderful tour! 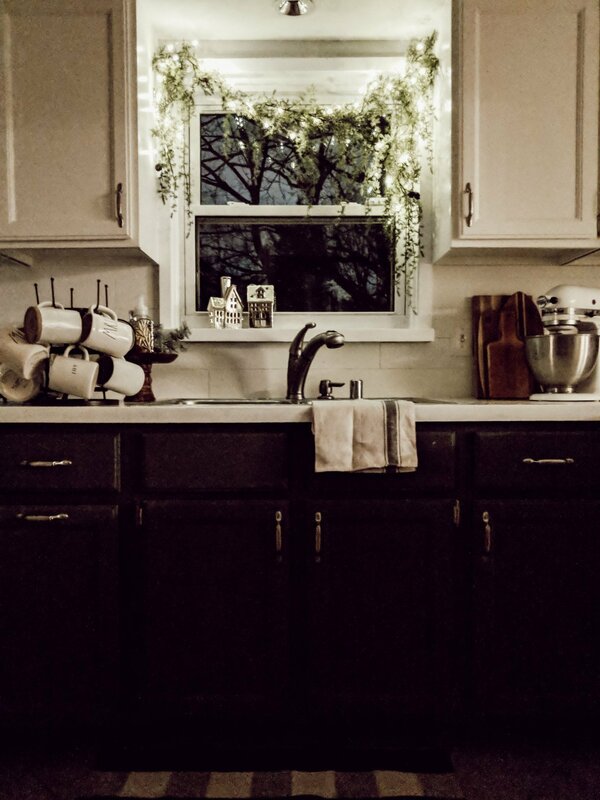 I love how your home is festive, yet still feels peaceful. 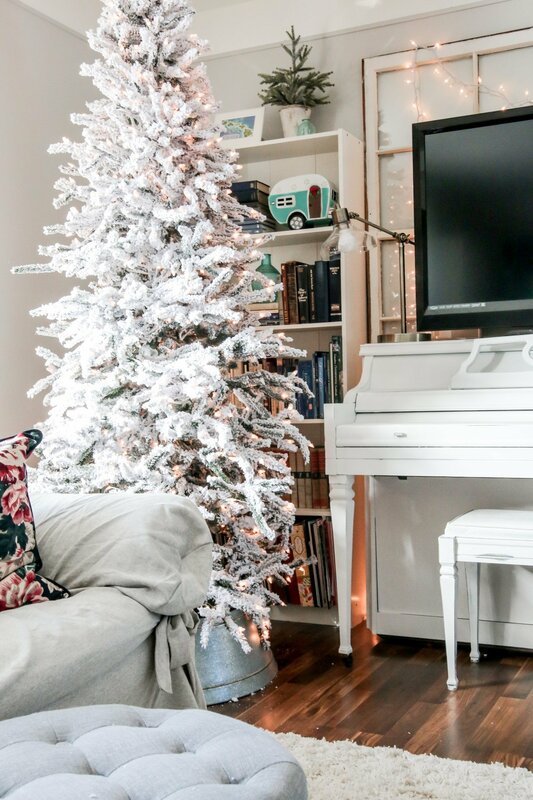 Your simple flocked tree is so pretty! 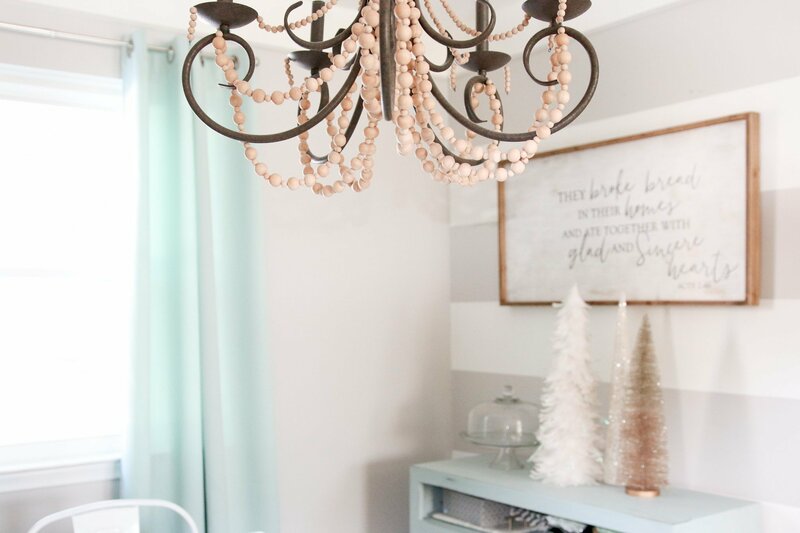 What a beautiful and serene home tour for the holidays. I can just imagine how stress-free and peaceful it feels enjoying it. Lovely job! 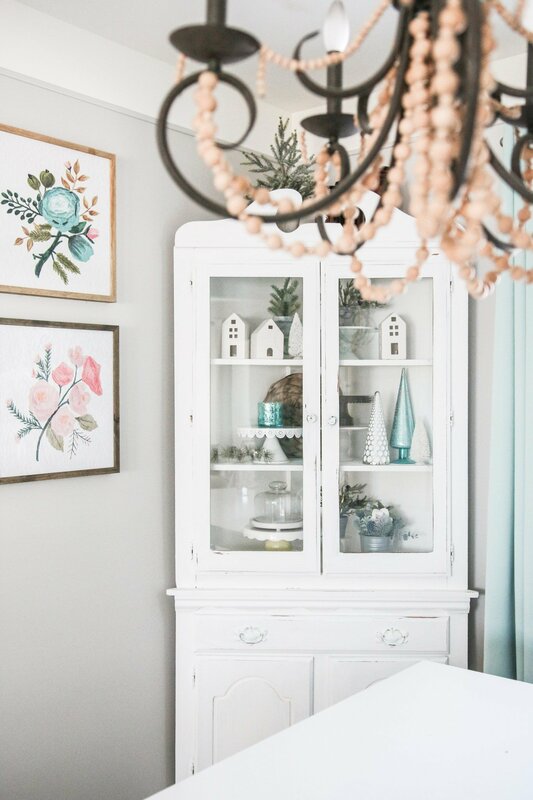 Your house looks beautiful Sarah! 3 to 5 kids in a little over a year is a lot! Love the flocked tree un-decorated. I tried to keep mine bare as well but my kids got to it when I wasn’t paying attention :) Merry Christmas!!! I can see why you love night time at your house. Everything looks so magical in the glow of the Christmas lights. Beautiful tour, my friend! It looks beautiful! I absolutely love your tree!